Smooths fine lines & wrinkles, reduces redness & pigmentation, plumps & smooths skin, creates a youthful glow. It’s a commitment. 10 mins daily for 8-weeks, then 4-weeks rest. Best results between 8 to 12 weeks. Repeat the cycle as you like. Very easy to use, no recurring cost of messy gels. Stings at first but this fades. Skin redness and tenderness after treatments. Tria give responsive and comprehensive pre and post sales support and offer a 60-day money back guarantees too. Lots of love mixed with charging problems criticism. Read this in-depth round-up to get the full picture. 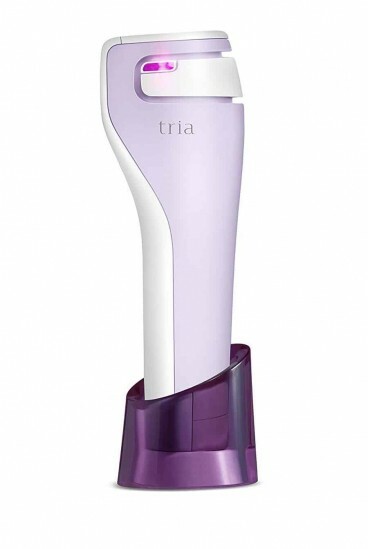 The Tria Age-Defying laser is a small hand-held at-home facial rejuvenation laser. It’s the same, although scaled down, technology doctors have used for over a decade. With clinical tests and FDA-clearance it’s proven safe for all skin tones and for home use. 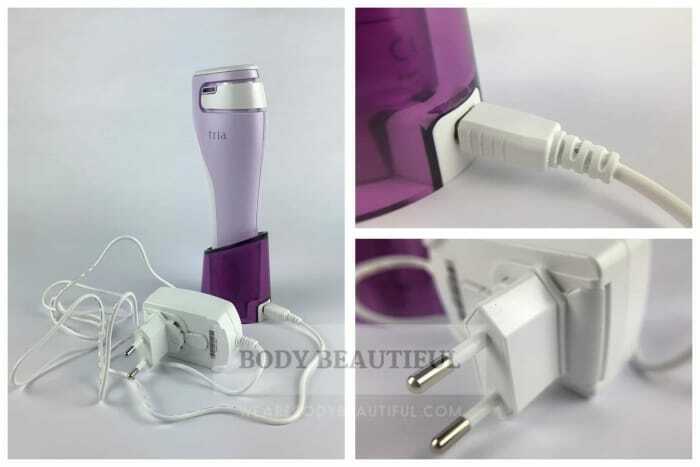 In the US it’s called the Tria SmoothBeauty laser. And compared to newer home-use anti-ageing devices it’s a veteran because it’s been available since 2013. But its popularity isn’t fading yet. The UK guidance is to use it daily for 8 weeks then take a 4-week break. Full effects are visible during this rest stage. Start another cycle to get even better results. In the US the guidance is to use it daily for 5 days a week for 12 weeks. Keep reading to learn more, including other key differences for UK users versus US, online feedback and pros and cons. The laser creates teeny columns of invisible injuries in the layers below the skin’s surface. The healthy areas around these micro-injuries start a repair job and so produce collagen and elastin. After each session, you get tiny bits of fresh skin and loads more shiny-collagen doing its thing. Over a few months your skin gradually perks up to look bright and clear and feel smooth and supple. 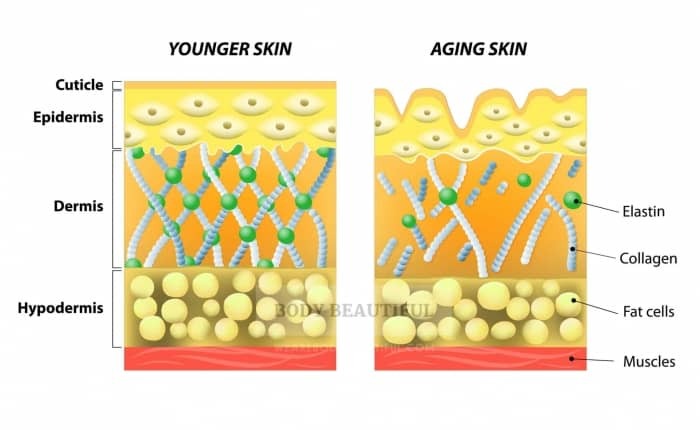 Collagen and elastin are the mesh of fibres that make up your skin. Collagen makes your skin strong and firm. Elastin keeps your skin tight. Fibroblast cells found in the dermis layer of your skin produce both. You’ve plenty when you’re young. But from around 30 you produce less and less each year. The result is fine lines, wrinkles, dull skin, rosy-redness and darker spots. Collagen creams can’t help because the collagen molecules are too big to sink into the skin. As you get older you produce less collagen and elastin and so your skin shows sign of aging such as fine lines and wrinkle, dark spots, redness and texture problems like large pores. The Tria laser kickstarts collagen and elastin production in your skin. It works to refresh and repair the signs of aging. To help, you must kick-start the fibroblast cells into action for a natural collagen and elastin boost. The Tria skin rejuvenating laser does this by creating tiny injuries in the skin. Your fibroblasts produce collagen and elastin to repair them. Plus, a load more that spread throughout your dermis repairing and revitalising. This gives you fresher, younger-looking skin. Because each session affects such a small amount of skin, you need loads of treatments to see visible results. 56 sessions to be precise. That’s once every day for 8 weeks. During this, all the old, dull and discoloured skin naturally exfoliates away. The micro injuries heal and fresh cells replace them. And you’ve super-charged skin by the ongoing collagen and elastin party in its layers. Thus, youthful, bright, supple and smooth skin. So, how does this laser-thing work? It’s a 1440 nm non-ablative fractional diode laser. That’s how. And for the non-boffin crowd, here’s what that means. First, what it’s not. An ablative laser vapourises the outer skin layer (epidermis). Ouchy. Your skin reacts by producing loads of collagen and elastin to repair and build a new epidermal layer. This ‘resurfacing’ has a dramatic effect on ageing skin by continuously producing buckets of collagen, but it takes weeks to heal and there’s a risk of infection. The Tria rejuvenation laser is non-ablative. This means the laser beam heats up and damages the outer (epidermis) and lower (dermis) layers of skin, but it doesn’t destroy them. Your body produces a surge of collagen and elastin to repair and renew the damaged cells, which then freshens up the rest of your skin too. OK, this sounds better. So, what does ‘fractional’ mean? Again, this is what it’s not. Non-fractional is where a single, larger beam of energy acts on the whole laser treatment zone. 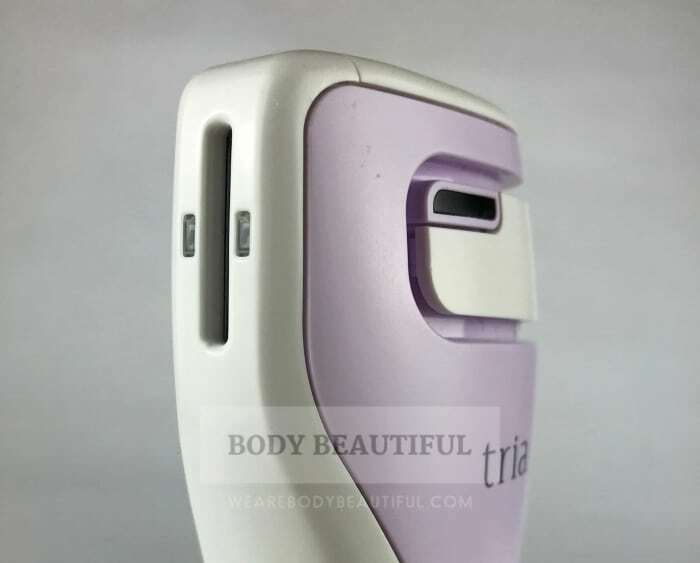 The Tria Age-Defying laser is fractional and this means it’s a pixelated laser beam, into many evenly spaced tiny energy columns. One clinical study calls them microscopic thermal zones, or MTZs. 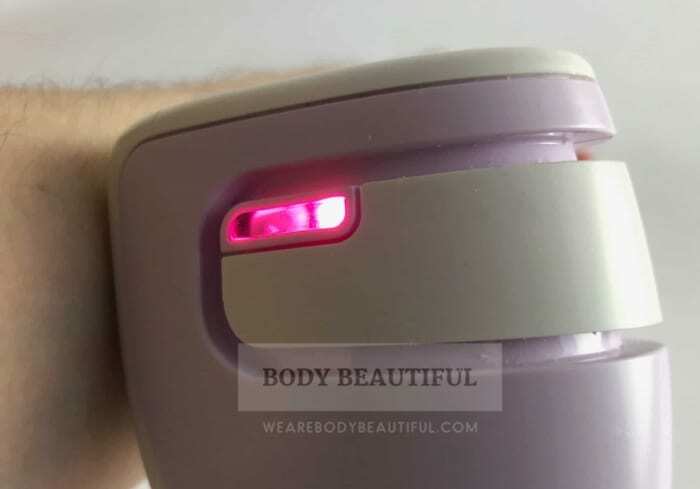 So, the laser energy acts on a ‘fraction’ of your skin in the treatment zone. And because there’s loads of healthy undamaged cells around these MTZs, healing is fast and efficient. With the Tria anti-aging laser it takes under 24 hours. 1440 nanometers refers to the laser’s wavelength. Tria couldn’t confirm this for me due to IP restrictions, however based on similar Diode lasers, it’s water in the skin that absorbs this wavelength. The laser heats it, thus creating micro-injuries at the right depth in the skin layers. So, in combination, this 1440 nm non-ablative fractional laser makes for more comfortable treatments with fast recovery and minimal side effects. It’s perfect for home-use. Now that’s clear let’s check how it compares to professional treatments. How does it compare to professional laser rejuvenation? 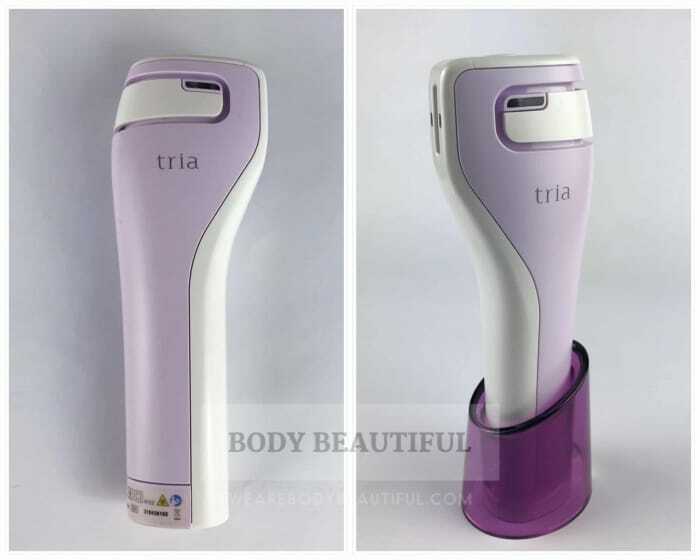 In comparison to a doctor’s clinic, the Tria laser uses much less power. The power output ranges from 5 to 12 mJ/pulse. In comparison, a professional grade non-ablative fractional laser is maximum 70 mJ. The depth the Tria’s laser energy reaches is 450 microns (a micron is a millionth of a metre, so it’s 0.45 millimetres). An example professional grade laser goes 500 to 1400 microns. This means with professional treatments you need fewer treatments to see results. Most doctors recommend 3 to 5. And there’s a few days recovery before your skin heals and is back to normal. With the Tria Age Defying Laser you need many more treatments, but your skin heals within 24 hours. Professional grade lasers have professional operators too. They’re medically trained specialists who configure the laser specifically to suit the patient. At home it’s just us, so it must be safe and simple. So, this is all good stuff. It’s designed to keep us safe, work with minimal discomfort, repair fast and still give visible results overtime. Reassuringly, there’s clinical proof of the safety and results too. Yes. There’s a clinical study. You can access a pdf download of the study abstract dated 2011 on the Tria Beauty UK website. N.B. For readers in the US: Triabeauty.com doesn’t share the study discussed below, or any other study on the website. Keep reading to the ‘For “crow’s feet” only’ and ‘FDA-clearance’ sections below for more information. The study of 34 participants lasted 20 weeks. The study was ‘split face’ which means each side of the face received a different 12-week treatment regimen with results recorded for each. The participants visited the study site and treated their own faces / zones. The regimens for each zone were either x5 per week or x2 per week sessions at different intensity levels. They assessed the participants regularly for 8 weeks afterwards too. Screenshot of the 2011 clinical study extract pdf available on Triabeauty.co.uk. You can see the before and after photos from the study there. 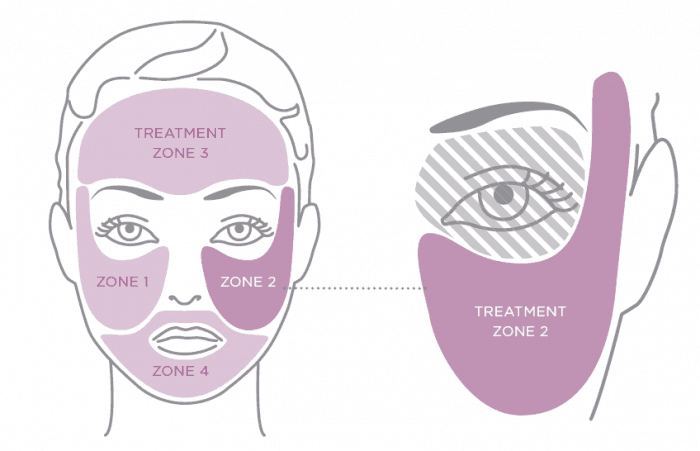 An independent and objective dermatologist assessed the treatment zones throughout the study. To avoid any bias in the assessment it was a blind study too. This means the dermatologist didn’t know the treatment regimen assignment to each facial zone. They merely measured and assessed what they saw. Using a 9-point scale, the dermatologist measured improvement in wrinkles, uneven pigmentation and diffuse redness. And with a ‘back-of-the-hand’ method they assessed skin texture too. 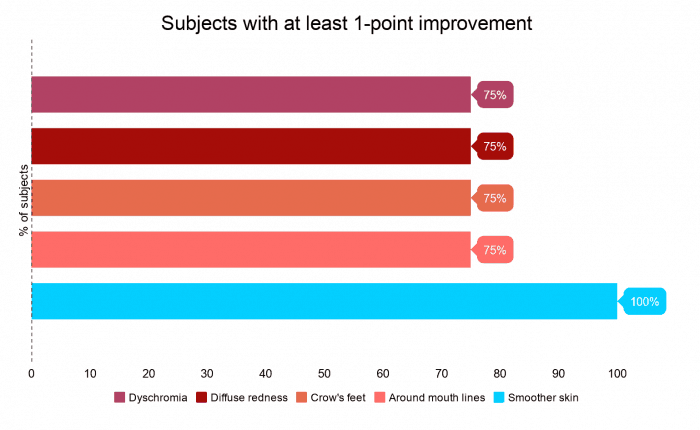 At least a 1-point improvement was clinically significant. The participants also recorded feedback during the sessions. They rated tolerability using a 1 to 10 scale where 0 is no pain and 10 is extreme pain. And they noted any side effects too. Periodically, they also answered satisfaction surveys. The 2011 study shared on the website shows the zone results for 5 daily sessions per week at treatment level 2. It includes three sets of before and after photos too. 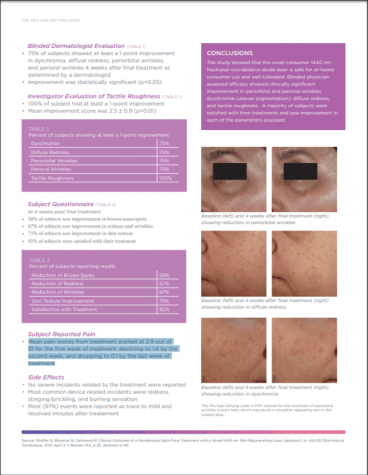 75% of subjects showed at least a 1-point improvement in dyschromia (uneven pigmentation), diffuse redness, periorbital wrinkles (around the eye), and perioral wrinkles (around the mouth) 4 weeks after final treatment as determined by a dermatologist. Participant survey results: 58% saw improved brown areas/spots, 67% saw improved redness and wrinkles, 75% saw improved skin texture, 92% satisfied with their treatment. Whilst the study uses fairly basic methods to measure results it’s seems comprehensive and objective enough. 75% is a good amount who saw improvement in uneven pigmentation, crow’s feet and lines around the mouth, but that does mean 25% didn’t. Regardless, the study does reassure me I’ll see results with the Age-Defying laser, although I’m not certain how dramatic they’ll be. It’s noteworthy also, the results are for level 2 intensity usage. Based on the higher intensity treatments being more effective you’d therefore assume level 3 will give even better and / or faster results. So, I can’t help wondering why Tria don’t share the results for level 3 intensity instead. I also couldn’t help comparing the study abstract user satisfaction survey results to those shared on the website. They don’t match so I wonder where they come from too. I asked but Tria weren’t able to confirm based on IP restrictions. The study also notes the Tria laser “is FDA cleared for the treatment of periorbital wrinkles (crow’s feet) which may result in smoother appearing skin in the treated area”. N.B. In the user manual for US users, it references a clinical study proving it works on “crow’s feet” too. This isn’t in the UK user manual. This means that whilst this 2011 clinical study shows it also works to fight redness, even out skin tone and smooth out texture problems the FDA haven’t cleared it, or indicated it, for these benefits. This doesn’t mean the clinical study is wrong. It’s just how FDA clearance works. 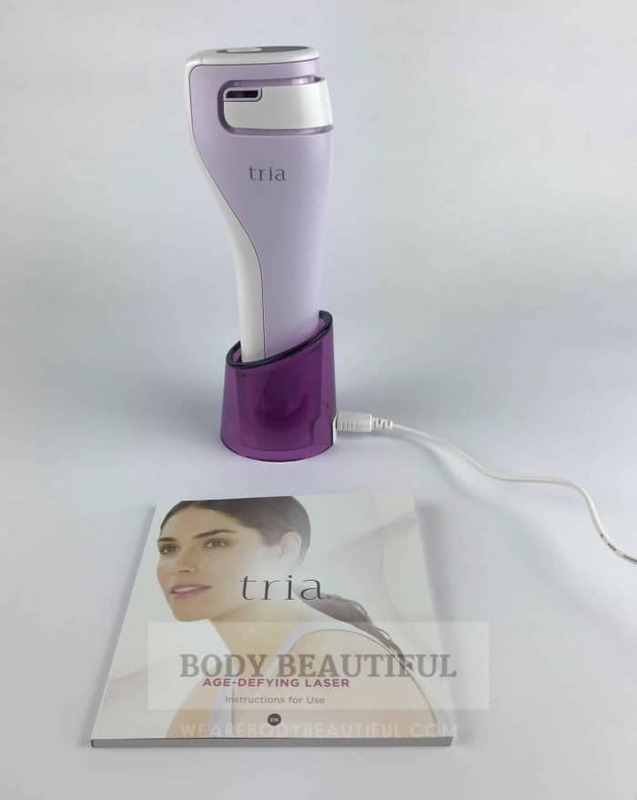 The US classes the Tria Age-Defying laser a medical device. The FDA governs these and so needs clearance before Tria Beauty can market it in the US. The easiest way is prove your device is similar or ‘substantially equivalent’ to another approved device. So, Tria Beauty have ‘substantially equivalent’ proof compared to other 1440 nm non-ablation fractional diode lasers already with FDA clearance. And because they’ve clearance for smoothing “crow’s feet” only, that’s what the Tria laser also has. This explains why the reported benefits and claims of the ‘Age-Defying laser’ differ noticeably in the UK to the US SmoothBeauty laser. This is relevant for readers in the US where Tria promote it for a smaller range of anti-ageing benefits. More on this next. 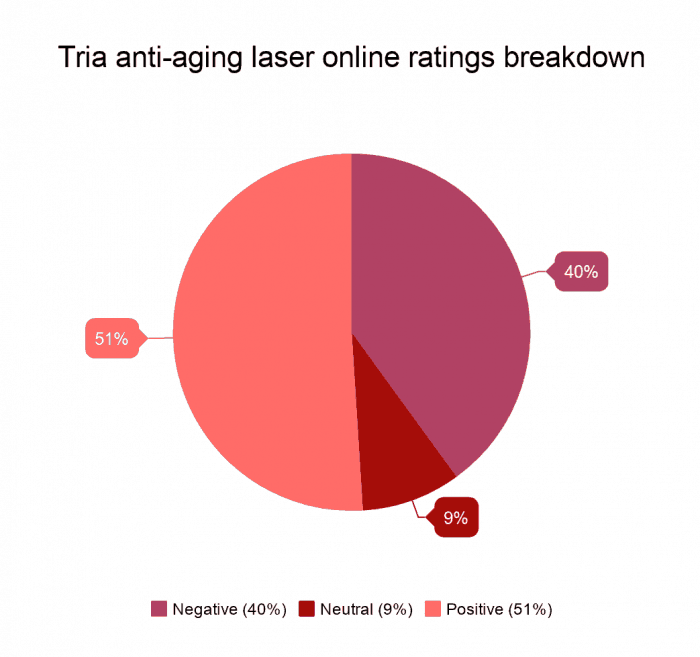 Tria Beauty use user satisfaction scores to promote the benefits of the Tria laser. And for the most part they’re identical for the US and UK. Both show high satisfaction scores for a reduction in fine lines and wrinkles around the eyes, in fine facial lines and wrinkles, smoother skin, and agreement it’s as effective as professional laser treatments. The 2011 clinical study supports this with results where 75% of subjects had at least a 1-point improvement. And as the FDA governs within the US only, Tria Beauty UK can promote this benefit without FDA approval. “87% of users say their skin looks more radiant and youthful’. Sounds just as good to me. So, in conclusion the Tria laser can also give even-toned and radiant skin, as well as smoothing wrinkles. Next, let’s look into what it’s like to use. The device laser comes in a neat white box. It’s smooth and sturdy with silver embossed Tria logos. It looks expensive. The layout is clean and spacious with a feminine and classy feel. The lilac laser is on 3 sides of the box with an almost life size version on the front. My UK version is in both English and German with clear and neat typeface in dark grey and magenta. 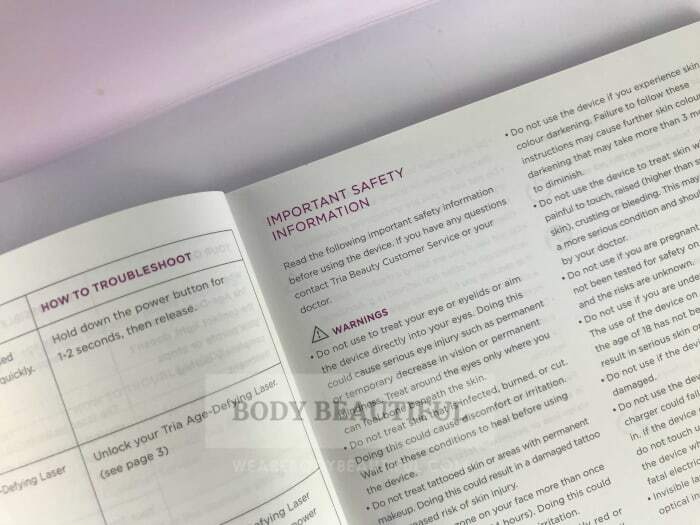 The same side also lists the reasons you should not use the Age-Defying Laser (more on this later). And there’s a very favourable quote from a very qualified Dermatologist. There’s more information in the open up flap too. It briefly explains how the laser works to generate collagen and highlights key user satisfaction scores from the clinical trial. 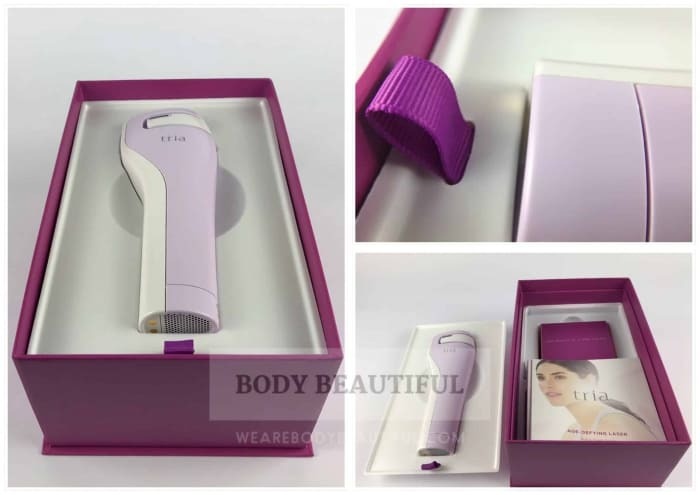 It briefly shows the safety and helpful features of the laser and the 3 simple steps to use it daily in minutes. There’s another doctor’s quote thrown in for good measure too. It’s attractive, well laid out and concise. 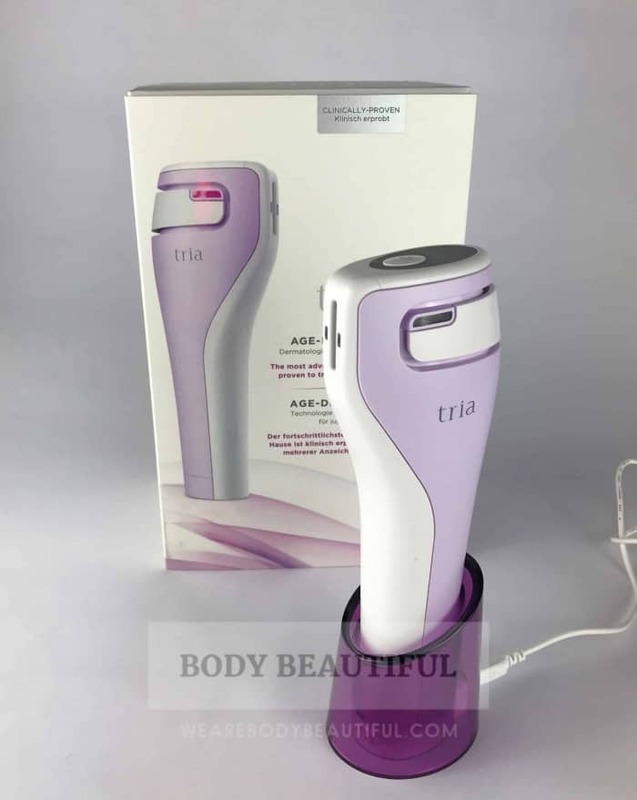 It does a very good job of selling the Tria Age-Defying Laser. The information sleeve slides off with a bit of wiggling. Beneath is a smooth white and beautiful magenta colour box. Remove the white lid to see the lilac device nestled in a white plastic mould. The compact box is beautiful with a silver-embossed Tria logo. It measures 15 x 25 x 10 cm. Keep it to store the Age Defying Laser in when not doing a treatment cycle. There’s a magenta ribbon you can use to lift the mould, and underneath see the user manual, quick start guide, charging cable and small charging stand. 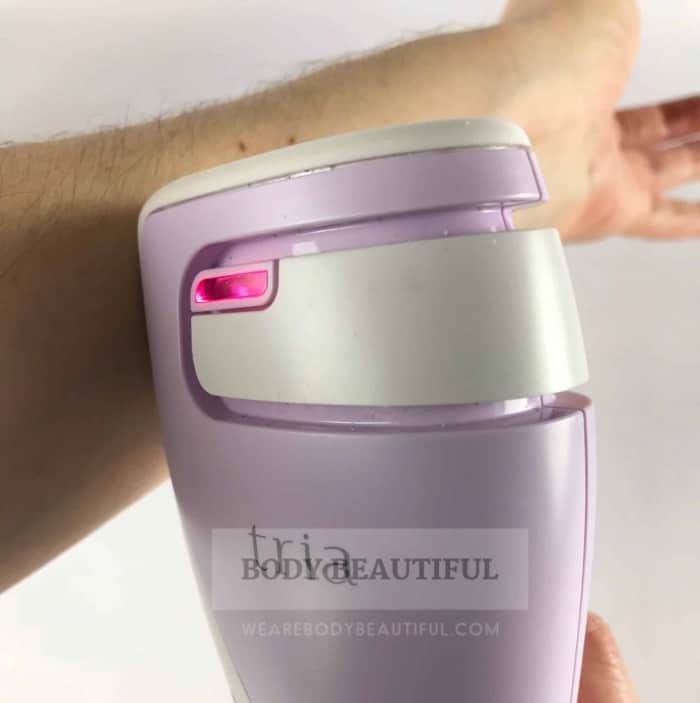 The Age-Defying laser is light-weight, smooth, cool to the touch and fits comfortably in my hand. It’s easy to lift and manoeuvre and is pleasant to hold. I grip it naturally on the handle where it curves up to the flat-sided business end. Here you can see a small slit opening about 22 mm high and 2 mm wide. This is where the fractional laser energy exits. 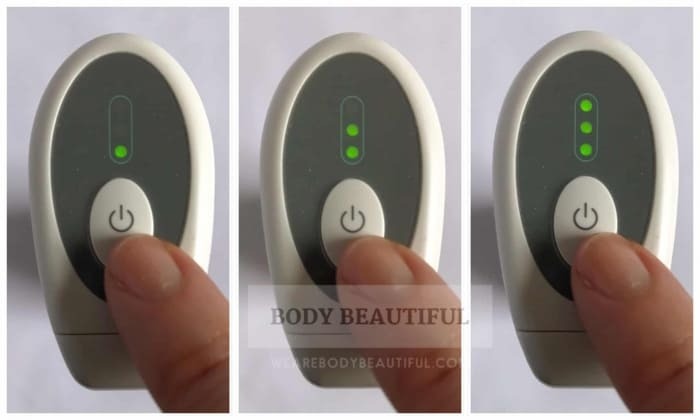 It has skin tone sensors inside the device (not visible) and has two small motion ‘displacement’ sensors either side of the slit that check the device is moving over your skin. There’s a single power button on top with other light-up logo indicators . It’s a simple design that’s not in the least bit scary. To use it you must charge it for 2.5 hours. The charging cable is 145 cm long so you need to charge it close to a power outlet. Choose somewhere where it won’t be accidentally knocked over, kicked or dragged off a shelf. Once you’ve found a secure spot get it going whilst you read the user manual. It’s quick to read the UK version. There’s just 16 pages in the English section. The booklet is small and neat, well-laid out and written. There’re plenty of diagrams to acquaint you with the device and understand how to operate it. It’s in a logical order. First what the key components of the kit are, and how to operate and charge it. Then, how to divide your face into zones and how to treat each, the different intensity levels, what to expect, and tips for use. It runs through how to clean and store it and has a troubleshooting guide. In amongst them, I see hints of 2 possible side effects: wrinkles getting worse, or skin getting darker. The manual implies the former could be a result of a more serious underlying condition, so go see a doctor. I checked in the US user manual and it shares more on skin darkening. It says that if you notice your skin darkening and don’t stop using the Tria Laser it could results in temporary skin darkening. They go on to share some study data. So, it’s something to be aware of and weigh up in your decision to buy the Tria anti-aging laser. 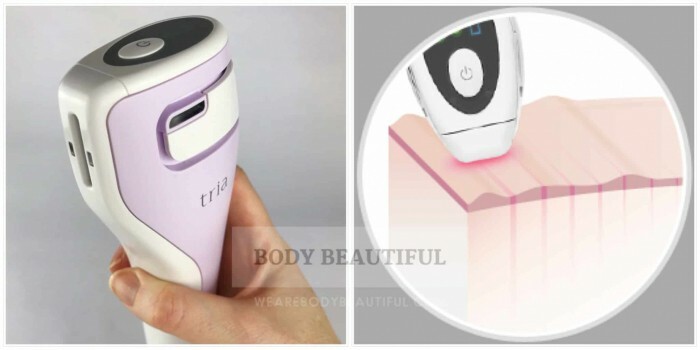 It’s very easy to use the Tria laser. Learn how in the next sections. Tria advise you to test a small area on your forearm at the level you intend to use. This gives you a heads up on how it’s going feel. They advise you to wait 24 hours to see if you have any side effects. It’s a good idea to understand how it’s going to feel on your face. 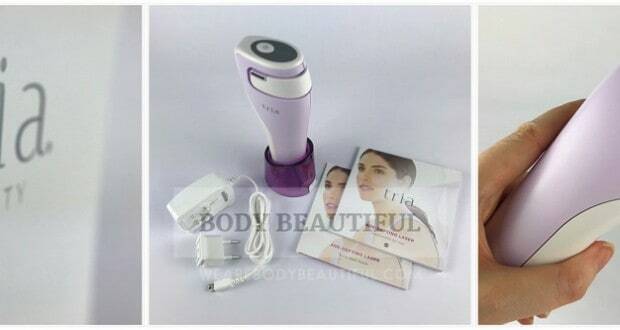 Test the Tria laser on the inside of your arm so you can feel what the sensation is like. Wait 24 hours, if there’s no side effects do your first facial treatment at level 1. Make using the Tria laser part of your evening before-bed routine. It’ll take around 10 minutes once you reach level 3. It’s easy to fit in, but you need to keep at it. Make time for it and don’t skip a night. You’ll need a mirror to start. You can use the Tria Cleanser or your own preferred cleanser. Press the power button to cycle through the 3 levels: low (1 light), Medium (2 lights) and High (3 lights). start with low to get used to the sensation. Apply your favourite moisturiser and / or serum. TIP: Always pop the laser back on the charging cradle. That way it’s fully charged and ready to go the next evening. 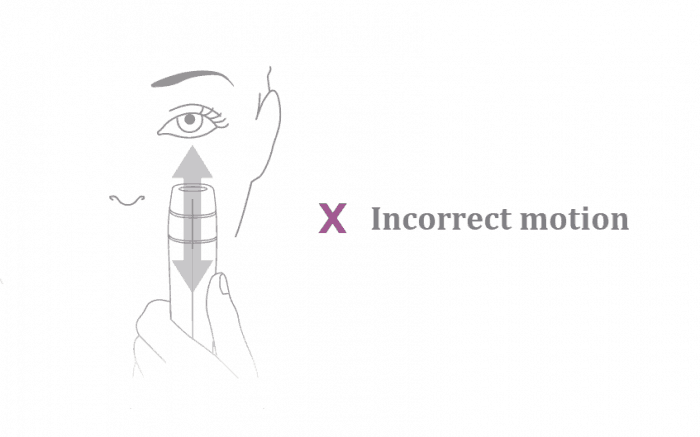 The following diagrams from the instruction booklet show the correct zones and motion to treat your face. Divide your face into zones: Start with your left cheek (1), then move to your right cheek (2), then your forehead (3), and finally your chin and around your mouth (4). Around your eyes, only treat where you can feel bone beneath the skin, and don’t treat your eyelid or above your eye. On your cheeks, chin and around mouth hold the device vertically against your skin and swipe it from side to side. On you forehead, use the same action or you can rotate the device 90 degrees and swipe it up and down. Don’t press it too hard or hold it on one spot. DON’T move the device in an up and down motion as you hold it vertically. The laser penetrates your skin in an unintended pattern and can cause discomfort and facial marks. You must have good contact with your skin for the laser to work. So you know, there are 2 pink indicators on either side of the device that light up when you have good contact and the laser is working. The device also makes a whirring noise as it works. The laser makes buzzing noises to let you know when the timer is done for a zone so you can move to the next. At the very end of the treatment it makes a ‘fanfare’ serious of beepy-buzzes. It’s like a victory call and it makes me smile every time. A green tick also illuminates on the control panel to let you know the session is complete. TIP: Wear a sunscreen (SPF 30+) every day. A tinted moisturiser with SPF doesn’t count! You may not apply enough of that to make a difference. Invest in one that’s going to protect your sensitive skin and prevent future sun skin damage. This is my favourite. It’s that simple. But there is more you need to know. There’s a handy safety lock you can activate to stop prying hands playing with your Tria. This is especially useful because when it’s charging, it’s likely to be visible on a shelf or table. So, the lock means any big or small curious investigators can’t turn on the device. You need to charge the Tria laser close to a power socket because of the short-ish power cable. It’s steady in the small charging cradle but easily knocked over if kept on the floor. Try a shelf or table instead. And lock it so curious hands can’t turn it on! 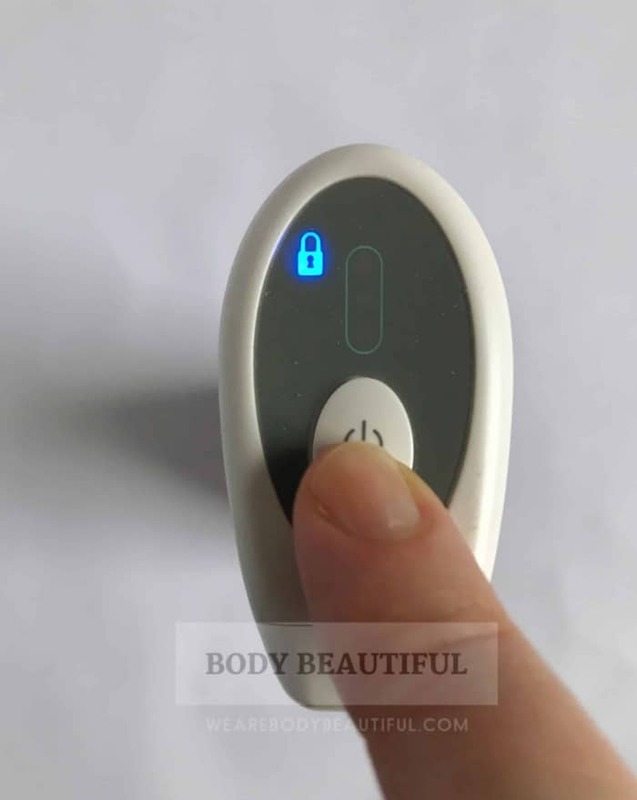 To activate the lock, press and hold the power button for several seconds until the lock icon lights up. To turn the lock off, press and hold the power button for several seconds until you hear 4 beeps, then release. The safety lock is activated when the blue padlock icon illuminates. Note: when unlocking it, if you hold it longer than 4 beeps it keeps beeping but doesn’t unlock. 4 is the magic number – release the button after 4 beeps and it unlocks with a happy sounding series of beeps! There are 3 treatment levels on the Tria Laser. You cycle through them by pressing the power button. Indicator lights show which level you’re on. Each level lasts for a different duration and has more or less laser power (measured in millijoules (mJ)). Start on level 1. It’s the least intense and quickest treatment. Once you’re used to the sensation and feel ready, you can move up to level 2 then 3. These levels give the best results. Tria say start at level 1 and ‘train’ yourself to the sensation. The zone timers are there to make sure you don’t spend too long on one facial area. It’s the optimum duration for the energy level to cover your skin and allow overnight healing. The US user manual shares that levels 2 and 3 significantly improved results for most study participants (for wrinkles around the eyes). So, it follows that you should get up to level 3 quickly. Tria say it’s a mild discomfort like a slight warming or prickling. It’s a bit like sunburn, and it fades shortly after use. Participants in the 2011 clinical study measured the level of discomfort during their treatments. And that doesn’t sound too bad. The online reviews confirm there’s a feeling of hot sunburn during and after the treatment. For some it’s more than just ‘mild discomfort’, but it’s bearable. Your skin can feel tender the following day too. Reassuringly, this gets less and less the longer you’ve used it. It takes about 1 week to get used to the sensation and then move up the levels. How does your skin react? During and after the treatment you’ll likely have noticeably pink or red skin, and it may swell a bit too. One online reviewer reports looking like a tomato! Sensations and effects on your skin vary by user. For some skin goes pink and stings a bit. For others skin turns red and can even swell up. One reviewer compared herself to a tomato afterwards. But these effects are temporary. You’ll may experience some swelling and stinging for a while afterwards. It feels like sunburn. And that’s not pleasant. Aloe Vera or other cooling gels help. Use a good moisturiser and serum afterwards to nourish the skin. A few online reviewers won’t use it directly before bed because the stinging stops them dropping off to sleep. It can take anything from a few minutes to an hour or two to fade. The next day, skin can feel tender and dry. Be gentle when washing and applying make-up. Your skin may even flake a bit. But go easy on the exfoliator. The user manual also mentions you may develop small brown dots on the skin. These are temporary and should disappear quickly. In the UK, Tria Beauty advise you to treat daily for 8-weeks, then take a 4-week break. The 4 weeks break is as important as the first 8 weeks. Your fibroblasts are still producing collagen and elastin and it’s important to let it balance out. Tria say you you’ll typically notice some effects on your skin after just 2 weeks of treatments. But expect your best results between weeks 8 to 12. You can then do another 8-week on and 4-week off cycle for additional effect. So, it’s not immediate and it takes commitment. If you’re on high level, you’ll use it for 10 minutes every evening. So, over the course of one 8-week treatment cycle you’ll spend around 9 and a half hours lasering your face. A few reviewers comment they’re not sure it’s worth the effort or they have mixed feelings. It demands commitment and a space in your evening routine. And it may seem like nothing is happening because results are subtle and gradual over 12 weeks. I suggest taking some before photos so you can compare your skin throughout, and at the end of 12 weeks. That way you’ll see results you may not have otherwise noticed. And you can decide if you’ll continue using it for further cycles. Tria say there’s no special requirements to maintain your Tria laser. If you use it regularly and charge the battery after each use, this will keep the battery life long. In the user manual, it says the Age Defying Laser should work for years. The US user manual says it’s a minimum of 3 years, and probably more. It’s an expensive item, but you can use it for multiple cycles throughout the year. The battery icon on top of the control panel flashes blue to let you know the battery is charging.. If a fault develops with the battery the icon will show red when you try to charge it. The Tria website is comprehensive and clear. You get FAQs and access to the user manuals. You also get helpful and friendly customer support via email and telephone. 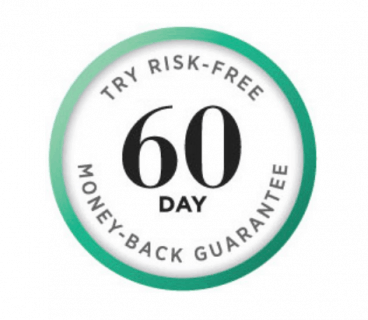 Tria in the UK and US promise a 60-day money back guarantee period. Whilst it’s not long enough to see your best results from the first regimen, it does allow you to test it and see if you like it. The money-back guarantee is 60 days. This doesn’t match the regimen guidance from Tria i.e. 8-week regimen and 4-week rest period. So, it’s not long enough to see your best results. Tria recently (January 2019) reduced it from 90 days to 60 days. I asked why, but Tria weren’t able to confirm (IP restrictions, again). But 60 days is enough to see if you’ll like using it and can stick with it. 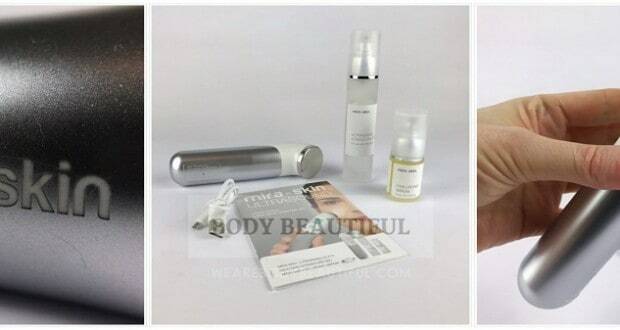 Tria Beauty give a 1-year warranty. Most other manufacturers give 2 years. However, if you buy from CurrentBody.com you get a 2-year warranty as standard. CurrentBody.com’s excellent customer service team assist you with warranties. But note, you may need to pay return postage for your laser. Regardless, I’d be happy with this in return for the extra year’s peace of mind. 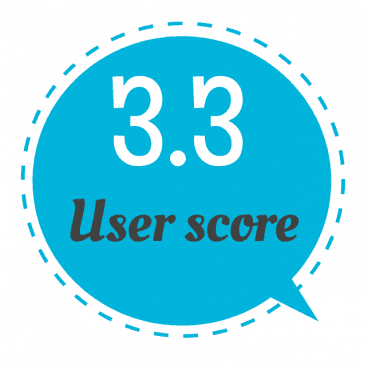 The average score is 3.3 out of 5. So, there’s a mixed bag of feedback. There’re almost 150 online reviews dating back to 2015. They’re from Amazon and CurrentBody.com. Since it’s been available since 2014, it seems Amazon removed the earliest reviews for some reason. The reviews break down into 40% negative 1 or 2-star rated, 9% neutral 3-star ratings and 51% positive 4 and 5-star rated. 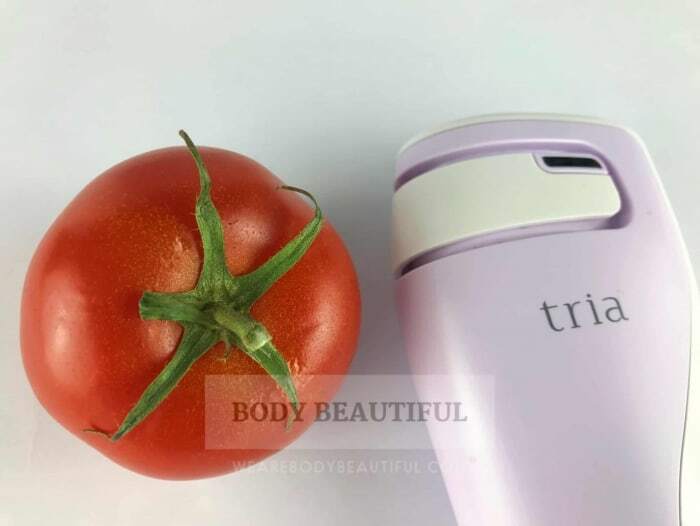 40% scored the Tria rejuvenation laser negatively at 1 or 2-stars, 9% gave a neutral 3-stars and 51% scored it positively with 4 and 5-stars. N.B. I’ve excluded Tria website reviews from this round-up. For a few reasons. 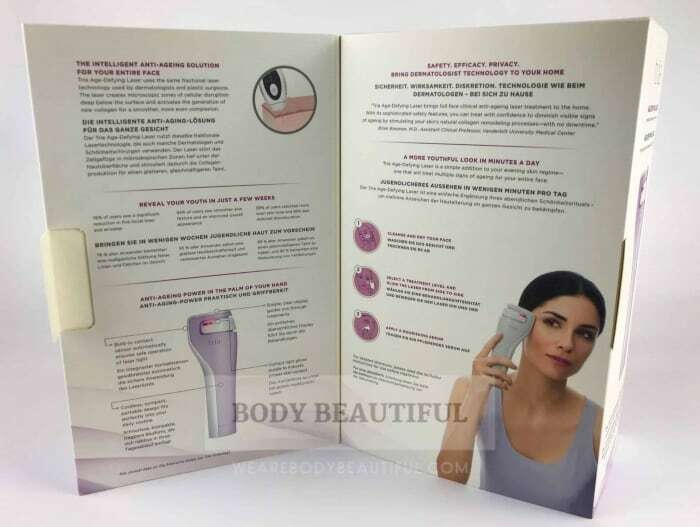 Firstly, the score shown for the SmoothBeauty laser is actually a combined score for all their anti-ageing products. This is misleading (skip past page 10 and you’ll see the other product reviews). Secondly, Tria authorise which ones to show and they’re overwhelmingly positive. They don’t match the sentiment and content of other non-affiliated sources. So, they’re excluded to give an accurate and fair round-up. Common themes in the negative reviews are faults, warranty disgruntlement and results. Just over half of the negative reviews report faults. They share devices won’t switch off and then won’t hold a charge, show an error or simply won’t charge at all. If you experience charging problems with your laser, Tria Customer service first send out a replacement charger to try. The Tria should last for 3 years but the reported faults in or around 1-year are worrying. Look for a minimum 2-year warranty. The faults start at different times. For some it’s within the first few uses and for others it takes weeks or months. Many can return their Tria under the 1-year warranty, but for several the warranty has already expired. A notable number had one or more replacements with the same fault. That sounds a round-about way of saying the fault is now fixed. Regardless, you’ll want the protection of a good warranty. 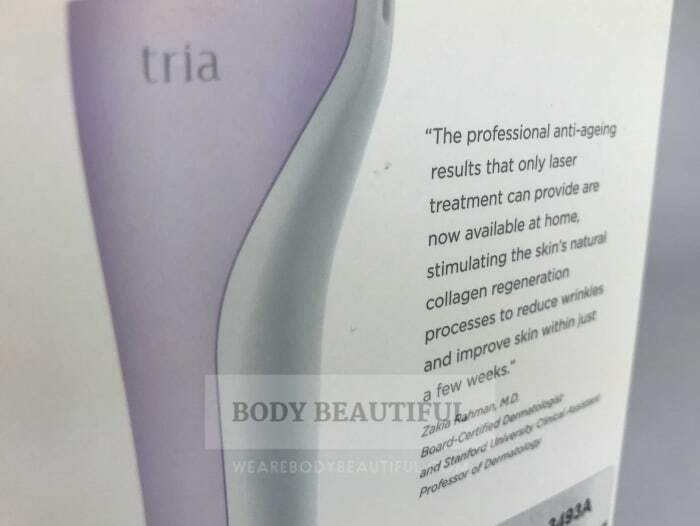 The US user manual says the Tria laser lasts 3 or more years with normal use. That’s reassuring, but based on the feedback there’s a notable amount saying it breaks within or just after 1 year. They therefore feel the 1-year warranty is too short. And combined with the high percentage of faults, it does seem so. Therefore, for extra peace of mind, I suggest buying from an authorised reseller who offers a 2-year warranty at no extra cost. 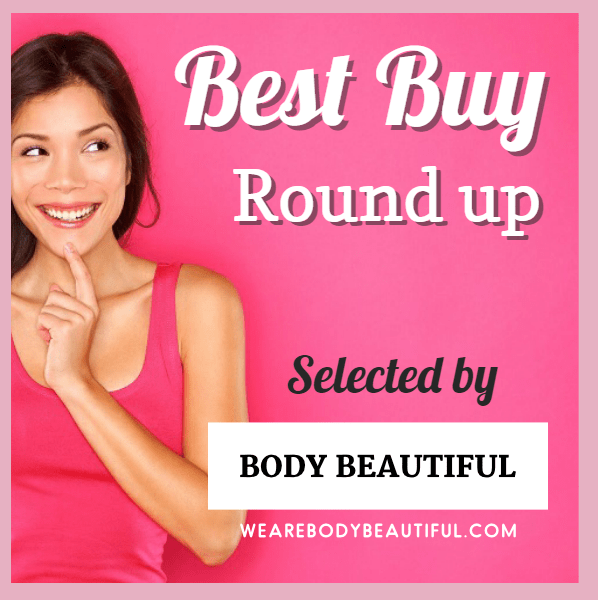 Try CurrentBody.com. They give a 2-year warranty as standard on all devices they sell (N.B. you may need to pay return postage). They also offer the money back guarantee. The remaining half of the negative reviews say they see poor results, skin damage or side effects. Just a couple report skin damage such as scratches and marks. And a few more describe side effects. These include persistent dark spots and wrinkles looking deeper than before. Of those with poor results, a handful don’t say how long they’ve used it. A few have completed 1 treatment regimen, and a few more are between 2 weeks and 1 month. They share they’ve not seen any results on their wrinkles and pigmentation. A couple feel the stinging and their red and sore skin afterwards means it’s not worth it so they want to stop. Just a couple used it for at least one cycle. There’re relatively few neutral reviews. A few come from users who are early in the regimen so have no results yet. Almost a handful say it works but the laser developed a fault or they’re not sure it’s worth the effort. Another feels the laser is too weak. And another gives up after 1 week because they find it too painful, even on level 1. Just over half the reviews (51%) are positive. And there’s some helpful feedback in there. So, what do they think about the Tria Age-Defying laser? A few think the packaging is beautiful and most think it’s easy to use. Several like there’s no messy gels. They like the facial zone timer and compare it to their electric toothbrushes. However, it takes a bit of practise to keep good contact on curvy areas so the laser doesn’t cut out. But it gets better with practise. Several describe the sensation as like tiny pin pricks, leaving a burning sensation which is more intense on the higher levels. It feels weird at first but is bearable. Some describe their skin afterwards as pink and stinging, whilst others say it’s like terrible sunburn with red skin. So, the sensation during and afterwards differs by person. However, the sun burn sensation fades quickly, usually within an hour. Most progress to the higher levels quickly, within a week or so. Some simply stay on level 2. Most then say the burning sensation fades till they feel virtually nothing. Over two thirds of the positive reviews say it works. Some report results but don’t say how long they’ve used it. The majority share their results early on. Several mention they have a ‘daily glow’ despite being just a week or so into the regimen. Many leave their reviews between 3 and 4 weeks. A few receive compliments on their younger looking skin and this prompts them to leave their review. They report seeing some subtle effects of the laser and are looking forward to seeing the full results later. Reported results are best in the ‘rest’ phase after treatments. Their dedication pays off. And there’re reviews from longer term users too. They’ve completed more than one cycle or have been using it for several years. It’s a firm favourite in their skin care routine. Most first-time users are keen to start another cycle after the rest stage. 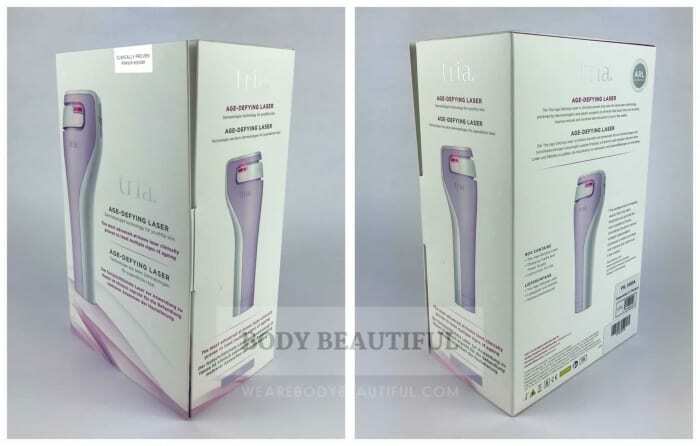 Next, a quick recap of the pros and cons of the Tria Age-Defying Laser from this review. Yes, it’s an effective at home anti-ageing tool you can use to get noticeable results. Multiple cycles can give even better results too. But there’s a few things to weigh up in your decision. The Tria rejuvenating laser has reassuring clinical study results. But the study shows after 1 cycle not everyone gets noticeable results for every sign of aging. So, results vary by individual. And you need to commit to it. It takes 10 minutes every day so it’s easy enough to make part of your evening routine. But results are gradual and it may seem it’s doing nothing. So, you’ll need to be patient and stick with it. It can sting to start, but as you adjust to the sensation it fades. And you may have red and / or slightly swollen skin afterwards. Dry skin is common too. 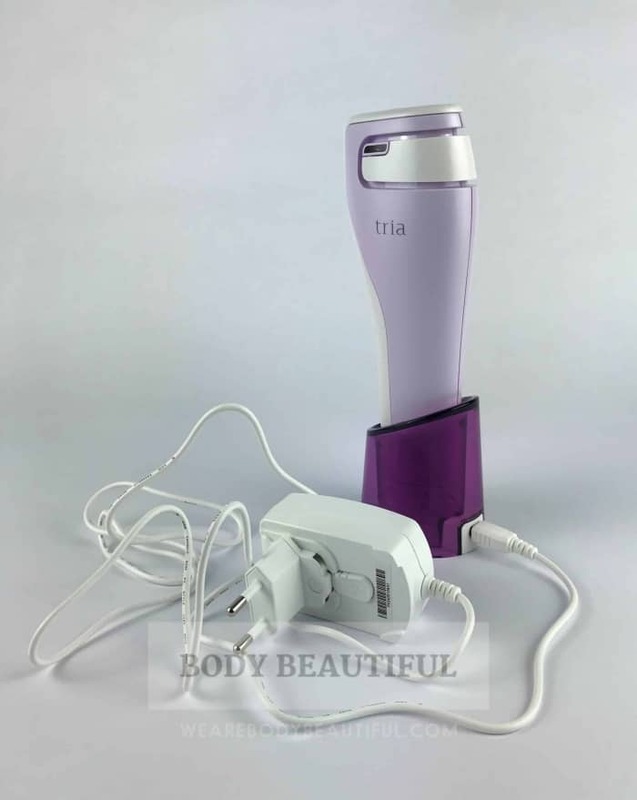 Tria Beauty is a trusted brand, but the online feedback reports a worrying number of charging faults with the laser. Based on Tria’s comment it sounds like they’ve fixed the fault in current models. But I think a 2-year warranty is important. Tria give only a 1-year warranty, but CurrentBody.com offer 2-years as standard. Unfortunately, the 60-day money back guarantee isn’t long enough to complete 1 cycle (including rest phase). But it lets you try it and if it’s not for you, you can then return it for a refund.